Luau Larry's mural puts Catalina Island visitors in the mood for an island cocktail. A short ferry ride deposits travelers on the shores of Southern California’s island getaway, Santa Catalina Island. Catalina Island visitors can fill their days exploring Catalina’s waters or touring Catalina’s interior. There is nothing better after a day of outdoor activities than sitting down with a refreshing cocktail, preferably with an ocean view, and Avalon has quite a few options for thirsty holidaymakers. 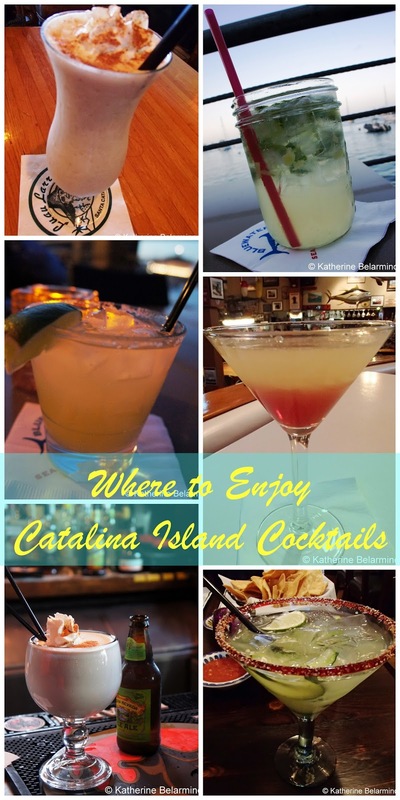 Did you know Catalina has a signature drink? It does, and that drink is called Buffalo Milk. The Buffalo Milk cocktail doesn’t actually contain milk from buffaloes. Buffalo Milk is a tasty alcoholic milkshake which gets its name from the bison that roam the island, which are descendants of bison that were brought over for a movie shoot and left behind. Buffalo Milk can be ordered at most bars and restaurants on the island with some slight variations. Our first introduction to Buffalo Milk was at Luau Larry’s, a colorful tiki bar on Avalon’s main drag along the water. Luau Larry’s Buffalo Milk contains vodka, Kahlua, crème de cacao, milk and fresh bananas, all blended with ice and topped with whipped cream and a sprinkle of nutmeg. The fresh bananas somehow make ordering this cocktail feel like a healthy choice. Luau Larry’s has a second signature drink, the Wiki Wacker. The Wiki Wacker is a mix of light rum, brandy, pineapple juice, orange juice, and grenadine, and also comes with a hat or a sticker so you can advertise to the rest of the island that you got your Wiki Wacked. We asked some locals where they thought the best Buffalo Milk could be enjoyed. I half expected a response to the effect that Catalina’s residents don’t drink Buffalo Milk and that it is just a drink for tourists. Instead, I received three suggestions, with the surprising winner being Antonio’s Pizzeria & Cabaret. Antonio’s has outdoor seating right on the waterfront, which is what pushed it over the edge as the location of choice to enjoy a frosty Buffalo Milk. Antonio’s recipe is the same, except it has a fourth alcohol, crème de banana, instead of fresh bananas. 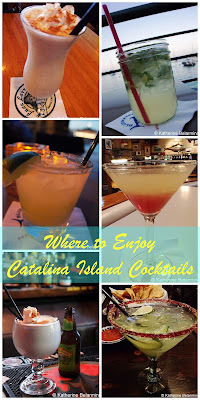 Another great choice for Catalina Island cocktails with a view is Bluewater Avalon. Not only is Bluewater Avalon one of the best restaurants on the island with fresh seafood and flavorful meals, it also serves refreshing signature cocktails which can be enjoyed on the waterfront patio. My favorite was the Cucumber Mojito with Shellback Silver Rum, VeeV Acai Spirit, fresh mint, cucumber, lime, organic agave nectar, and soda water. I’m a fan of mojitos, and Bluewater’s mojito is refreshing, not too sweet, and has an added interesting layer of flavor from the cucumber. Another Bluewater favorite is the Pilikia Margarita made with Sauza Hornitos Plata Tequila, Cointreau, fresh lemon juice, fresh orange juice, and lemon lime soda. Mojitos and margaritas with views of the water and Casino at Bluewater Avalon. If you’re looking for a spicier option, look no further than Catalina’s newest restaurant, Maggie’s Blue Rose, which is just next door to Luau Larry’s. Maggie’s Blue Rose is a Mexican restaurant serving a number of margaritas and other signature cocktails. I tried their most popular margarita, the Cucumber & Jalapeno Margarita. This spicy concoction contains Patron Silver Tequila, fresh cucumber and jalapeno muddled with tequila, Cointreau, and sweet and sour. The Cucumber & Jalapeno Margarita has quite a kick which is cooled down by the addition of cucumber. I can see why it has quickly become popular. The Lobster Trap, a restaurant on one of Avalon’s side streets, serves a sweeter lineup of cocktails, including the Raspberry Lemondrop. The Raspberry Lemondrop looks like a sunset in a glass and is made with Pinnacle Raspberry Vodka, Pinnacle Vanilla Vodka, sweet and sour, and raspberry liqueur. The Lobster Trap also serves their own version of Buffalo Milk with chocolate sauce squeezed up the insides of the glass. on the boat inside The Lobster Trap. If an ocean view with your cocktail isn’t quite enough and you’d rather feel the sand between your toes while enjoying an alcoholic beverage, the Descanso Beach Club fits the bill. The Descanso Beach Club, just past the Casino, is the only place in Avalon where drinks can be enjoyed on the beach. Drinks can be ordered while lying out on the beach or enjoyed at the outdoor bar. Just in case cocktails aren’t your thing, Catalina Island Brew House has a continuously rotating collection of eight craft beers on tap, which can be ordered by the glass or in a flight. During our time on the island, Catalina Island Brew House was serving Golden Road Cabrillo Kolsh, Big “O” Brown, Hangar 24 Orange Wheat, Monkfish Belgian Amber Rosa’s Hips, Denogginizer Double IPA, Bootlegger’s Belgian Golden Ale, Eagle Rock Populist IPA, and Inland Empire Porter. Beer flights at Catalina Island Brew House. Finally, Catalina cocktails cannot be discussed without mentioning the Marlin Club. The Marlin Club is the oldest bar in Avalon and has been serving drinks for over 60 years. The Marlin Club is your standard bar with a pool table, foosball, darts, and a jukebox, except the bar itself was built to resemble a World War II boat.